Hello friends, Happy Saturday! This week at Hiding In My Craftroom we are having our color challenge...we are using three Stamping up colors as our guide: Artichoke, Curry and Cajun Red. Of course this is a jumping off point and you don't have to use these exact colors. I broke out my favorite paper line which often features that color combination ...Graphic 45 of course! I made a card with the combination of a art cut-out from the Botanica Bella which I colored in from with Distress markers (the sea horse), I used the Tim Holtz chit chat words stickers and copied it onto craft paper, on that I stamped An botanical image with clear embossing powder then I placed it onto some dry embossed cardstock. The background paper is from the French Country collection. 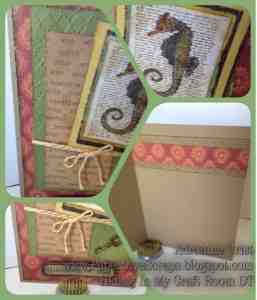 Added a Tim Holtz sentiment, a Graphic 45 key staple and some twine. I made a few other cards with this same combo which I'll post another time. I loved this Combo!